There are so many awesome projects that are free, require no account, and are sponsored by Google. If you haven't checked out these "secrets," also know as the lesser known tools, you should! Today, I added the following to my Secrets of a Google Ninja presentation. The SciShow and The SciShow Kids: Learn and explore all the science you can imagine from the comfort of your own home and computer. These two YouTube channels are stellar. CrashCourse and CrashCourse Kids: Learn and explore any subject you want in one intellectual spot. You can find more All about that Google at fennovation.org. Searching like a ninja is my favorite skill. It's also a pet peeve of mine. When you can't search, it's hard to be productive, efficient, or to advance. If you can't find quality information, you can't learn from it and you can't move forward. Finding valid information is critical today. It is a basic, fundamental skill. With that, I've been compiling my favorite Google search tips into one presentation. Though we teach students a variety of engines to use when searching, Google is the one they use when they go home. It is usually the one they use when they are on their own. So, why not teach them how to be proficient in it. How is your proficiency? Do a Google search for "fun facts." It will provide you with a random array of questions and their answers...a quick way to learn trivia. This week's topic: Whose blogs do you draw inspiration from and why? Though I write my own blog, I don't follow any particular blog religiously. Rather, I like to follow media that curates the info into one location. For example: Google +. With a resource like Google + or Twitter, I can peruse many blogs and sites a like. The main reason I like blogging is for writing purposes. It provides the perfect platform for writing and for sharing. And the best part is that you have a global audience even if no one is reading. I'm not alone in this either. When I first started blogging on Google's Blogger, I would get followers of my blog specifically. And, I would follow blogs. However, over the past couple of years, I have not noticed many new followers on my blog or others' blogs. Yet, my page views have increased dramatically, which means my views have gone up, but my direct followers have not increased. My students are like this as well. It's a shift in how we curate information. In the past we may have followed a few blogs and only assumed that knowledge. Now, we use platforms like Google + to see a wide range of self-selected blog posts. So, I can't say I follow a blog in particular. Instead, I peruse Google + multiple times a day, searching for topics that grab me. For me, it's more about the topic than the author. I have co-workers who read for enjoyment and some who read for theory. I read for new applications. I enjoy finding new ways of doing something. I'm about efficiency and productivity. Do you follow anyone in particular or do you follow ideas? I'm about the ideas. Today, I continue my series of hacks I have found to make Google Apps even better. Is it possible? YES! Recently, I discovered the following "hacks" that have transformed my Google use. Check out the presentation below or at fennovation.org for more hacks! Once you feel comfortable (no expert status necessary) with Google Apps, it's helpful to step it up a notch with Google Add-ons and Google Apps Scripts. Last spring, I read about a cool way to use Spreadsheets as a student response system. I also discovered and utilized Awesome Tables - my favorite find. I love infographics. Though you could argue they are just another form of presentations (which they are), they also encourage concise writing, something my students always had difficulty doing. Last year, I worked with our librarians and 9th grade students to great infographics related to issues in the time of To Kill a Mockingbird. Even though we gave students examples of infographics and repeated that the text must be concise and powerful, they still copied and pasted huge chunks of text. So, we had to do it again, and again, and again. The point: this was clearly a skill students were missing. In the era of attention-getters and short text, it's a critical skill. So, I'm compile a presentation of infographics resources to meet the needs of students and teachers alike. See something I'm missing? Let me know, please! You can check out more resources at fennovation.org. All of your #coding resources in one place! Three years ago, I started my first coding club. As a former English teacher, coding is not in my background. In fact, math was my most difficult subject followed by Science. However, I felt drawn to coding. It felt logical (nice pun, eh?). I jumped on the coding bandwagon before there was an Hour of Code. And, in some ways, I am skeptical of everyone doing computer science or coding for the sake of it. They needs to be reason behind it and you need to understand that reason. For me, that reason is because it is a language. It's the backbone of so much of what we do today. Do we need to understand the inner-workings of a car? No. We do not need to understand computer science and coding because they are the backbone. Rather, we can learn them because they are a natural method of teaching logic - something that can be hard to learn otherwise. And, the benefit? Perhaps, we produce students who take an interest in coding and can use it to transform modern technologies. Isn't that what we are doing now? Students are able to change the world. It's no longer something just for adults. Coding equals the playing field. With that in mind, I've been compiling a list of resources for educators of any background to use for computer science. Check them out here, below, or on fennovation.org! Wishful thinking, right? Well, while we wait for Google Sites to get a makeover, I gave my own Google Sites - Volume 1 presentation a makeover. Check on fennovation.org for the advanced edition as well as other Sites resources. Despite the rumors, you really can make a beautiful Site. Check it out! This week's topic: Write a letter to your students. What do you hope for them? Currently, most of my students are teachers. However, I do have a 9th grade advisory, 9th grade lunch table, and I work with middle school and upper school tech clubs. So, I will split this letter in two: one for 9th graders and the other for established teachers. Last week, I spent three days camped out in the wilderness with 130 of you. You never slowed down. Even when I thought it humanly impossible, you kept moving, fidgeting, talking, screaming, singing, running. You are bounds of energy. You mutli-task like there's no tomorrow. For the first time in my life, I legitimately felt old. We complain about your immaturity, your endless chatter, and your constant fidgeting, but that is what gives you life. With that, you are excited about life. Being "old," I see others get burnt out. They stop fidgeting, they stop chattering, they stop being excited. They stop learning. Never stop learning. You're never too cool to learn. Someone else always knows something you don't. Surround yourself with others who build you up, but remember that you alone are enough. Others will not provide you happiness. Objects will not provide you happiness. Only you can determine whether you are happy. Don't search your whole life for happiness only to find (or not) that it's within you. You only have one life. Until recently, I heard this and I understood it, but it didn't relate to me. It was like an old battle to me. I know it happened and it was horrific, but I could not relate to it. I get it now. You only have one life. You will never be a 14-15 year old again. Enjoy it, but don't make it damage who you are as a 30, 40, 50, 70, 100 year-old. Remember: live like it's no one's business. Learn. Learn as much as you can - not because someone told you to, but because you want to. You decide your happiness. You are enough. So, find what's inside you that makes you happy. Don't be afraid to not know it all. We all say we are okay with this, but in practice, this is often far from the truth. We chastise the use of technology often because we don't understand it. And, when we don't understand it, we deem it hard to manage. And, if we can't manage it, we don't want it. But, you need to stop managing everything. Part of this is due to standards dictated by those higher than us. We can't change policy overnight, but we can start. Be the student you want to have. Keep learning. Never stop. When you feel burned out, seek help or reflect on your profession. You need to be happy too. Though short, I think both letters can be applied to the same audience. We need to encourage life-long learning and happiness. What would you say to your learners? Last week's topic: In 100 words or less, describe the most important characteristics of 21st century instruction. It is funny we still use the term "21st century" 15+ years into the century. I say this not to pick on the topic, but to show that we use because some are still teaching as if it were the 20th century...or 19th century in some cases. We would not need to distinguish if we were all teaching in the same century. Though harsh as it may be, it is crucial to note these observations. I recently went on a retreat with 130 ninth grade students to an area with no cell reception and no Internet connections. We told our students no cell phones, tablets, or computers were allowed. This is not something we would have told students in the 20th century or before. However, we have to distinguish now. Our students are different now. But, in many ways, we treat them the same. We judge them for doing things different. We dislike that they are not learning the same things as we did. We think they are being corrupted by the woes of technology. We don't like that they share out personal information to others. We don't like that they multi-task. I had another epiphany about these "21st century" children and their learning. If they were reading books as much as they are on their phones, would we have a problem with it? Both are isolationist activities. If we only have a problem with the technology, why do we dislike it so much? Is it just because of the tech? I hear my parents and others question why we don't teach some of the skills they learned as children. To that point, I will ask - why don't we also revolve around a farmer's schedule? We don't because the economy and lifestyles no longer call for it. How often will a student need to use some of the skills we are so greatly offended by that are not being taught? We get upset when we say "they can just look it up" as if looking something up is easy or a cop-out. So, we don't teach students how to search. Instead, we continue to teach them skills that are irrelevant rather than the most important of them all: searching. Though most teachers I talk to agree that students do not know how to search, I still see those same teachers asking students to research without providing any instruction. This is where we go wrong. We say, well kids today aren't as competent. They don't know some of the basic skills and they don't find factual information. Is it the students' fault they can't find the information or is it our fault for not teaching it? It's easy to criticize each new generation as not being as strong, as smart, as fast, etc. as your generation. It's even more easy to blame it on technology. But, are our students' failures and successes entirely due to tech or to the fact that they are a new generation? A teacher reminded me a few days ago that an average teenage brain has 2 million brain cells where an average 25 year old only has one million brain cells. This means their brains are firing twice as fast as a 25 year old. It means they are equipped to multi-task. They are wired to multi-task. We, however, are not. We must separate our learning styles from that of our students. When we do that, we can begin to teach students how to multi-task and search responsibly. We cannot teach responsibility until we accept that we are no longer in the 20th century, the 19th century, or any other than the 21st century. We need to accept while students need to learn responsibility. But, aren't those they same skills we've always needed to learn? Yes. We need to apply them to a world filled with tech, however. What do you think is essential in instruction? Chrome continues to amaze me with its apps and extesnsions. The ceiling is nearly limitless with the Web Store. Because of this, I have organized apps and extensions I either swear by or others have recommended to me into the Let's Get Chromified Presentation as well as into a directory (made with Awesome Tables). Read all about them in the Let's Get Chromified Presentation or Chrome Directory. As I work to compile a digital citizenship task force of students and teachers, I reflect on some of my favorite digital citizenship/literacy resources available to use for FREE. 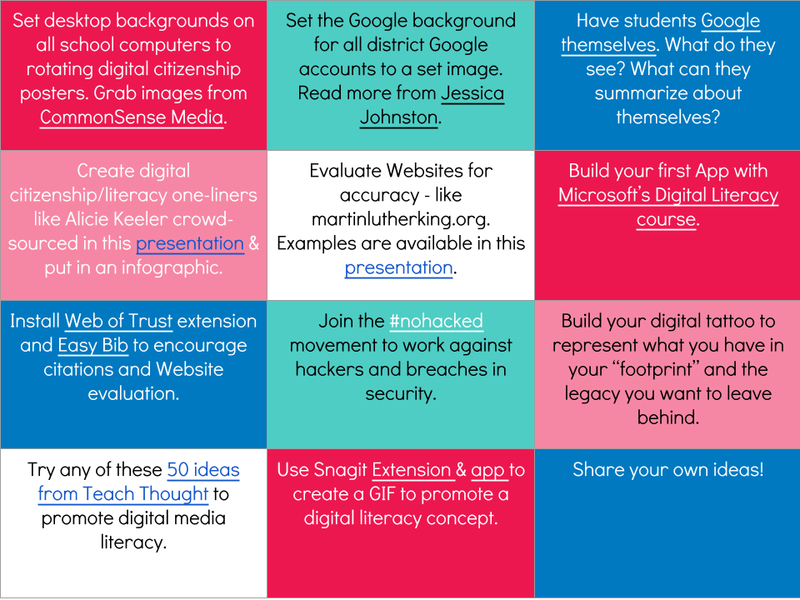 Start working on your digital citizenship plans with these amazing resources and ideas. Find more of my favorite tips and tricks on fennovation.org. The Google Yourself Challenge infographic! If you haven't joined the #beyouedu movement, you should. Each month there is a new topic and each month, I feel re-focused. Each month, I am inspired again. Each month, I have bliss - through writing and through a network of passionate educators. However, my bliss is not confined to education. In fact, bliss comes from all aspects working together in harmony. Just as negativity can stretch across lines, so too, can bliss. For that reason, I call myself a bliss-seeker. In my grandparents' and my parents' generations, there was more job consistency. If you took a job as a teacher, you stayed a teacher, despite feeling bliss or not. My generation is different. Many are quick to leave when bliss is not apparent. Other generations sometimes scorn this bliss-seeking. And, though, I agree that failing and seeing something through are critical to success, so is seeking bliss. So, I aim for balance. When I have bliss in my personal life, but cannot find it in my professional life, I know change is needed. Likewise, if I have it in my professional life but not in my personal life, I know change is necessary in my personal life. That said, bliss is interconnected. Bliss is not just limited to who you are as an educator. It is who you are as a person. So, how do you find your bliss? Start by making time each day for at least one action that makes you happy. This can be stepping outside, taking a hot shower, visiting your nieces, or simply reading a book. It's that single action that helps dictate our level of bliss. For me, I find that when I haven't made time for myself to be outside, removed from others, I lose that bliss. I am not alone in this idea, though. Many "introverts" are the same way. Remember this when dealing with students or co-workers. Space is a critical component to bliss. Space is key to creativity as well - both the lack off and abundance of. What feelings do you get when you have minimal space compared to an abundance of space? I bet you have different moods for each. When finding your bliss, it's also important to remember that "you are enough." External things and people can make us feel happy, but it can be short-lived. The saying "you make me happy" is only partially true. You dictate your own happiness. Another person or thing can impact it temporarily, but you decide it long-term. So, you must first decide to be happy before you can find your bliss. Though, it's not as simple as it sounds. We do not wake up and say "I'm going to be happy today." No, rather, it comes as we make time for those blissful moments each day. It comes when we find permanent actions that contribute to our best state-of-mind. When you mold these ideas into a professional setting, you must make sure you are achieving a balance - making time for those blissful moments. Sometimes, we blame work for making us unhappy, but it's really our lack of making time for blissful moments. Give yourself time each day - even if only a minute. Cherish those moments. Take deep breaths. Finding your bliss is about finding you. I find me when I make time for being outside, when I get to inspire others, when others have their ah-ha moments. I cherish these moments. How do you find your bliss? What is your bliss? There have been a ton of changes to the products within Google Apps within the past few months. Below, I've highlighted a few of my favorites. Check out Fennovation.org for all resources on Google Apps (specifically, those within Drive). This week's topic: What does your classroom say about you as a teacher? What purposeful choices have you made as you created the space you share with students? The ironic part of this topic is that I'm still waiting on an office and a computer. Due to construction, I currently don't have a space so I am floating. So, this will be about the space I am trying to create. As a classroom teacher, my room was full of color. Students' writing and art covered all corners of the room - the ceiling included. Pillows and blankets dotted one corner of the room while a check-out book shelf lined another corner. The shades around the window were pulled back to let the natural light in. Often, I would not even turn on my classroom lights if the natural light was bright enough. Fall scents filled the air. Generally, I wanted the room to be welcoming, creative, and warm. As a teacher, I strive to be all of those things. In fact, my classroom was very similar to my home. It was home-like with a creative twist. I allowed the students to have a voice in design as well. I changed up the orientation of the tables frequently. I let the students paint a wall. I allowed the students to decorate their writing on butcher paper and line the ceiling. I know my personality was still the most dominate in the room, but they had a creative a voice, which is often the most important. Now, my space is an office. However, it's a space I plan to host clubs and numerous teachers. So, my plans for it are vastly different than my former classroom. My goal is to have a space to host personal trainings and exploratory zones. With this in mind, it will have a wonder shelf, a small makerspace shelf where faculty and students can come to explore various creative tools and concepts. I will have featured challenge cards every two weeks to provide guidance, but it will primarily serve as a safe area to try out creative endeavors. It will also have a round table to host student clubs, intimate conversations, and trainings. Since it is the only area in my corridor with a window, it will have an open window to provide natural light. I've found natural light to be a natural mood-lifter. It amazes me the difference it makes in learners. It will have color - lots of it. This is partly because I thrive on color, but also because many colors affect moods. Moods affect learning and creativity. So, an easy way to encourage creativity is through color. It will have multiple Chromebooks for learners to come and learn in a safe space. My space-to-be is centered around learning and creativity. I have purposely provided multiple small spaces to encourage creativity and to encourage discussion. As I get my new office, I will post pictures and will chronicle my wonder shelf journey. What does your space say about you as a person? As an educator? What would your ideal space have in it? This year, one of my big goals is to develop makerspaces around campus - including in the library. We have already formed a group of interested teachers, ready to take on the challenge. Due to space limitations, we are proposing a maker class (with each teacher teaching a specialized portion) and several small maker areas, each with a specific theme. In meeting and reviewing all things maker, I have stumbled upon some amazing resources, which I have included in one presentation. The Exploratorium, based out of San Francisco, offers a free tinkering/maker course online. You are responsible for purchasing the materials for the course, though. Site with ideas for sewable art - artist site - would Bea Baldwin be interested in this? Image search of wearable electronics - Bea Baldwin? You can learn more on STEAM and maker movements at fennovation.org. Google Classroom has grown a lot since it was born just over a year ago. In fact, in the past two weeks, it has endured some major updates. What does that mean for you? I've compiled some of my favorite resources as well as best updates into one presentation. Credits to Jennifer Rubin for helping with some of the classroom integration. Check it out! And, check out fennovation.org for more resources. This week's topic: What are two things you can do different/better this year? This is a question I often ask students and teachers so it's great to have it turned on me. My first thought was to think of what I would do different or better...in education. I think that's usually the first thought of educators. And, even though this is called #YourEduStory, your edustory should extend beyond the classroom. The best educators are the ones who are whole people. So, I want to extend mine beyond what I will do better or different in education and generalize it to my whole person. The more I write my edustory, the more I realize our stories are not compartmentalized. They overlap and are tightly integrated. We are not an educator from 8-4PM, a mom from 4-9PM, a sister on weekends, etc. We are all of those things ALL the time. So, our edustory is our story. Now that the semantics are out of the way - what are two things you can do better or different this year...in all aspects? Stress is always my number one priority in improvement. My motto this year is: it's okay to say no. I've been the "yes mam" for years and it takes a toll on your life. Contrary to the movie, it does not always yield the best results. Initially, it feels like it does because you are heavily involved, but it's not sustainable. So, I'm trying hard this year to prioritize what is important and say "no" to the things that don't improve my life quality, but say "yes" to the little things. I want to say yes to looking after my nieces more; say yes to long kayak rides; say yes to visiting my parents; say yes to more painting; say yes to more game nights; say yes to the "extras." I want to learn to say no to taking on more tasks the wear me down. As much as I enjoy taking on leadership roles, it's the people in my life that will sustain me - not additional tasks. This year is the year to saying no to tasks and saying yes to people. That's a hard distinction to make and it's even more difficult for teachers to say. Educators are some of the most committed of all. We are committed to our jobs. However, we are committed to the point of burn out and not to the avail of students. Students will benefit from us being whole people. They benefit from us having a life outside of the classroom. Think about your most influential teachers - they were probably more than a teacher to you. They were a person. Be a person to your students. Embrace all the things that make you, you. My next improvement is on creativity. I love being creative but because of point #1, it becomes #2 on my list. This year, I am focusing on my creativity and making. I am trying things I never tried before. I am experimenting in makerspaces, creating a new repertoire of experiments. There is reason why creativity is one of the 4Cs. Being creative is what leads to innovation. I would rather have "average" students who are willing to be creative than "above average" students who do not take creative risks. When things are not entirely streamlined, we find creativity. And, sometimes in those moments of creativity, genius happens. What will you do differently or better this year? How will you make yourself a 3D/360 person? Today's feature post is not on encouraging more girls into STEM, but on changing STEM to be more inclusive of diverse thought. 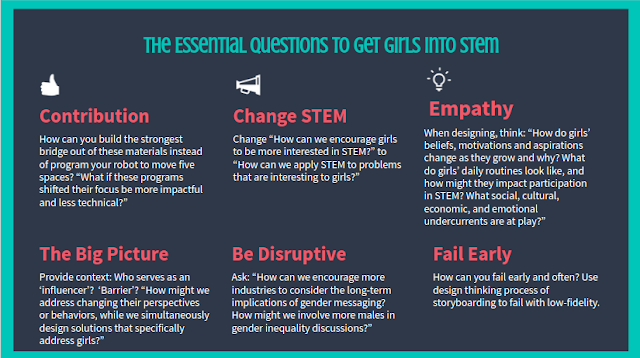 I read an awesome article from EdSurge on the questions we need to be asking to change STEM. 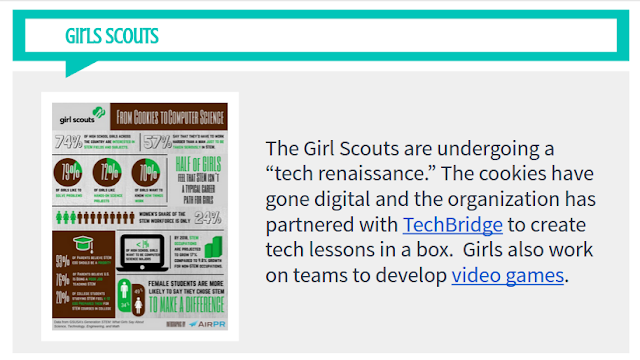 I have posted the highlights of that article as well as a number of resources for girls in coding/STEM/STEAM on my Girl Power presentation. As more resources become available, I will continue to post them. You can find all of my resources at fennovation.org. Enjoy! TeachThough includes even more resources for girls and STEM (40 to be exact). And, the Girl Scouts are going STEM!